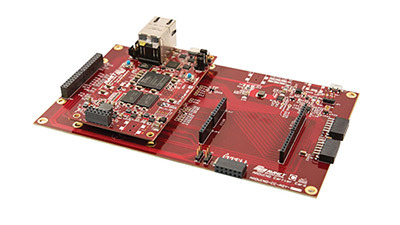 The Avnet MicroZed Industrial IoT Starter Kit supports designers’ edge-to-cloud development of Internet-connected solutions and includes all the necessary building blocks for developing a production-ready, IoT-enabled, industrial processing system. The platform is based on Avnet’s MicroZed™ system-on-module (SoM) with Zynq®-7000 All Programmable SoC from Xilinx and pluggable sensor solutions from Maxim Integrated and ST Microelectronics. The kit integrates the IBM Watson IoT agent on top of a custom-configured, certified image of the Wind River® Pulsar™ Linux operating system. The provided out-of-box example design uses a standard MQTT messaging protocol to communicate with Watson IoT, which enables registered, secure connection to additional cloud services and applications, including the IBM® Watson™ IoT Platform built on IBM Bluemix®. Bluemix provides a rich palette of composable services to rapidly enhance IoT solutions with cognitive capabilities.